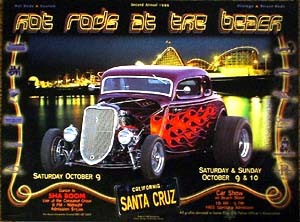 "Hot Rods at the Beach" at the Santa Cruz Beach Boardwalk, Wild West's first annual poster for this event was so well received that photographer Bob Barbor and Seal teamed up again to create their second poster. Using one of their friend's hot rods and stunning photo of the boardwalk at night Seal created neon style that brought it all together. The license plate is an example of Seal realistic illustration.